For the Tampa Bay Lightning, February presents an important test. Playing against Western Conference teams, many of whom are considered to be bigger and tougher, the Eastern Conference leading Lightning can make a statement by earning points in a good chunk of these games. It may be a relatively small sample size, but the Lightning have six of 10 points during Week One of the grueling and demanding month of February. They lost an overtime heartbreaker to the St. Louis Blues last Tuesday, allowing the tying goal with about three minutes left in a game they essentially dominated. Two days later, the Bolts weren’t at their best for 40 minutes but still found a way to win, 5-3 over the Dallas Stars. Two nights later, the Lightning were back at it. This time traveling to the Music City where they’d face off with the league’s new top team, the Nashville Predators. 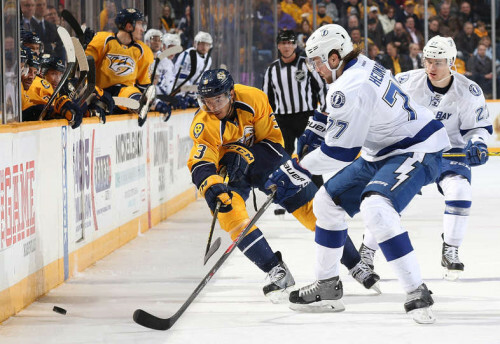 40 minutes in and things weren’t looking good, as Pekka Rinne had completely shut down the NHL’s most dynamic offense and the Bolts trailed 2-0 entering the final frame. A quick goal by winger Brett Connolly brought the confidence back, with Nikita Kucherov tying things shortly thereafter. That was enough to send this game into extra time. Unfortunately, the Bolts couldn’t cash in on numerous glorious opportunities, setting the stage for James Neal to end things seconds before the horn sounded to end overtime. Stamkos said they’ll take the point, but shouldn’t be “satisfied” with just one. They’re a good team, too, time for them to believe that. Now, the Lightning host the Blues Thursday night before embarking on a five game, 10-day trek out west. Two points are paramount, as it’s difficult to win on the road, more so when you’re in two different time zones against playoff contenders San Jose, Anaheim, LA and Colorado. Arizona’s likely not headed to the postseason, but they’re still a tough team playing for pride and jobs next season (or the remainder of this one, with the trade deadline approaching). Upon returning home, the Lightning host the Chicago Blackhawks, another team who’s won multiple cups in the past five seasons. That’s quite a gauntlet if you ask me. Can the Lightning hang tough with some of the NHL’s elite? While unknown, the ability to do so and earn points this month will go a long way in determining whether Tampa Bay’s a team capable of making serious noise come playoff time.